Though there is an increasing amount of work on mental health within HCI, there is little work reported on digital technologies specifically for those affected by self-harm. A literature search showed that most existing work within the context of self-harm had been conducted within psychiatry and psychology, and I began to imagine the ways in which technologies could help those affected by self-harm: not just those who engage in the practice, but their friends and family, too. We decided to configure and run a hackathon as an opportunity to explore the opportunities, challenges and best practices involved in designing for those affected by self-harm. Although there have been very few hackathons in such challenging contexts, we felt it was an excellent opportunity to bring together diverse communities of people in an environment where they could learn and create together. After careful deliberation over an appropriate and sensitive name for the hackathon, we decided upon Self-Harmony and it ran over two days in April 2016. Teams of developers, makers, healthcare practitioners, and those with lived experience of self-harm were asked to conceptualise and prototype digital products or services for those affected by self-harm. Seven teams formed around three challenges and created seven diverse digital tools – ranging from a digital distraction box (shown above), to an e-stress ball. 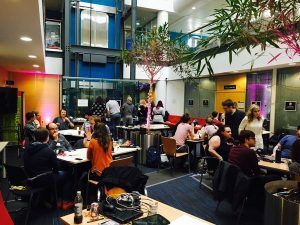 Often with the end of a hackathon comes the dispersion of ideas, teams and concepts, and hackathons are often criticised for this very reason. We decided to extend the conventional hackathon format by holding a series of critical engagements with mental health clinicians and charity workers who provided appraisal of the prototypes and designs. In doing this, we wanted to reveal the key strengths and limitations of the designs and expose design challenges for future HCI work that considers self-harm. The stakeholder critiques have also allowed us to consider the benefit of extending and rethinking hackathons as a design method in sensitive contexts.